Mr. Ojala performs numerous Loading & Lashing Surveys for weldments and equipment being transported by barge. This includes Stability Reviews and Towing Approvals, as well as lashing design, welding requirements, etc. 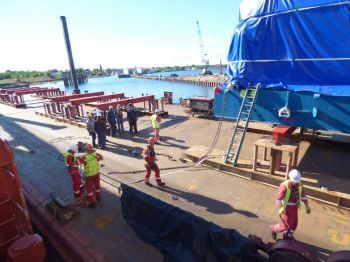 Mr. Ojala also attends the loading and lashing operations, approves welding of pad-eyes and proper installation of chain, cable, straps, ratchets and turnbuckles. Such surveys have been performed all over the Great Lakes, but any location would be considered. © 2019 A3 PI Services, LLC. All RIghts Reserved.